· Fuller, John, ed., ALIENS IN THE SKIES, New York, Putnam’s, 1969. · Fuller, John, INTERRUPTED JOURNEY, New York, Dial, 1966. · Hynek, J. Allen, and Jacques Vallee, THE EDGE OF REALITY: A PROGRESS REPORT ON UNIDENTIFIED FLYING OBJECTS, Chicago, Regnery, 1975. · Jacobs, David Michael, THE UFO CONTROVERSY IN AMERICA, Bloomington, Indiana Univ. Press, 1975. · Keel, John, UFO’S: OPERATION TROJAN HORSE, New York, Putnam’s, 1970. · Puharich, Andrija, URI: A JOURNAL OF THE MYSTERY OF URI GELLER, Garden City, Doubleday, 1974. · Reeve, Bryant and Helen Reeve, FLYING SAUCER PILGRIMAGE, Amherst, Wisconsin 54406, Amherst Press, 1957. · Butler, W. E., THE MAGICIAN: HIS TRAINING AND HIS WORK, London, Aquarian, 1963. · Holroyd, Stuart, PRELUDE TO THE LANDING ON PLANET EARTH, W.H. Allen Co., 44 Hill St., London W1X8LB, England. · Leadbeater, C. W., THE ASTRAL PLANE, Adyar, Madras, Theosophical Publishing House, 1970. Note: Although most of these books can be obtained from their publishers, in the case of MUFON, the address to use in enquiring about their PROCEEDINGS is the same as for SKYLOOK magazine. · Leadbeater, C. W., THE DEVACHANIC PLANE OR THE HEAVEN WORLD, THE CHARACTERISTICS AND INHABITANTS, Adyar, Madras, Theosophical Publishing House, 1948. · Manning, Matthew, THE LINK, New York, Holt, 1974. · Muldoon, Sylvan and Hereward Carrington, THE PHENOMENA OF ASTRAL PROJECTION, New York, Weiser, 1969. · Newbrough, John Ballou, OAHSPE, Amherst Press, Amherst, Wisconsin 54406, 1882. · Ostrander, Sheila, and Lynn Schroeder, PSYCHIC DISCOVERIES BEHIND THE IRON CURTAIN, Englewood Cliffs, Prentice-Hall, 1970. · Raudive, Konstantin, BREAKTHROUGH: AN AMAZING EXPERIMENT IN ELECTRONIC COMMUNICATION WITH THE DEAD, New York, Lancer, 1971. · Steiger, Brad, MYSTERIES OF TIME AND SPACE, New York, Dell/Confucian, 1974. · Steiger, Brad, REVELATION: THE DIVINE FIRE, Englewood Cliffs, Prentice-Hall, 1973. · Taylor, John, SUPERMINDS, New York, Viking, 1975. · Tompkins, Peter and Christopher Bird, THE SECRET LIFE OF PLANTS, New York, Avon, 1973. · Valentine, Tom, PSYCHIC SURGERY, Chicago, Regnery, 1973. · Wilson, Robert, THE COSMIC TRIGGER, And-Or Press, P.O. Box 2246, Berkeley, CA 94702. · Watson, Lyall, SUPERNATURE, New York, Bantam, 1974. · Adamski, George, FLYING SAUCERS HAVE LANDED, Hackensack, Wehman, reprint. · Adamski, George, BEHIND THE FLYING SAUCER MYSTERY, New York, Warner Paperback Library, 1974. · Adkins, Diana, INTRODUCTION: CONFRONTATION, The Netherlands, Servire/Wassenaar, 1970. Order copies from the author, c/o Orb Institute, 3209-11 M Street N.W., Washington, D.C. 20007. · Betherum, Truman, ABOARD A FLYING SAUCER, Los Angeles, DeVorss, 1954. · Layne, Mead, FLYING DISCS, San Diego, Borderland Sciences Research Associates, 1954. · Menger, Howard, FROM OUTER SPACE TO YOU, New York, Pyramid, 1959. · Nada-Yolanda, VISITORS FROM OTHER PLANETS, Miami, Mark-Age MetaCenter, 1974. Order Copies from Mark-Age MetaCenter, 327 NE 20 Terrace, Miami, Florida 33137, free catalogue also available. · Trepanier, Clyde, MAN, CONSCIOUSNESS AND UNDERSTANDING, Annual publication since 1959. Published by the author. Inquire for copies c/o the author, 14212 NE 75th St., Redmond Wa. 98052. · Van Tassel, George, THE COUNCIL OF SEVEN LIGHTS, Los Angeles, DeVorss, 1958. · Wallace, Baird, THE SPACE STORY AND THE INNER LIGHT, published by the author in 1972. Enquire for copies c/o the author, Box 158, Grosse Ile, Mich. 98138. · Williamson, George H., and Alfred C. Bailey, THE SAUCERS SPEAK, London, Spearman, 1963. · Williamson, George H., OTHER TONGUES, OTHER FLESH, Hackensack, Wehman, 1965. These two sources below are not contactees as such, but their material is closely related to the contactee material and as such is interesting. · Phylos The Tibetan, A DWELLER ON TWO PLANETS, Hackensack, Wehman, 1952, 1970. · Phylos The Tibetan, EARTH DWELLER’S RETURN, Hackensack, Wehman, 1970. · Probert, Mark, THE MAGIC BAG, SAN DIEGO, published by the author, 1950. · Aerial Phenomena Research Organization (APRO) BULLETIN, 3910 E. Kleindale Rd., Tucson, Arizona 85712. 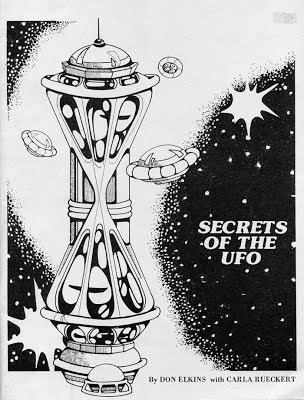 · Center for UFO Studies (CUFOS), International UFO Reporter, 1609 Sherman Ave., Suite 207, Evanston, IL 60201. · Mutual UFO Network (MUFON), MUFON UFO Journal, 103 Oldtown Rd., Sequin, TX 78155. 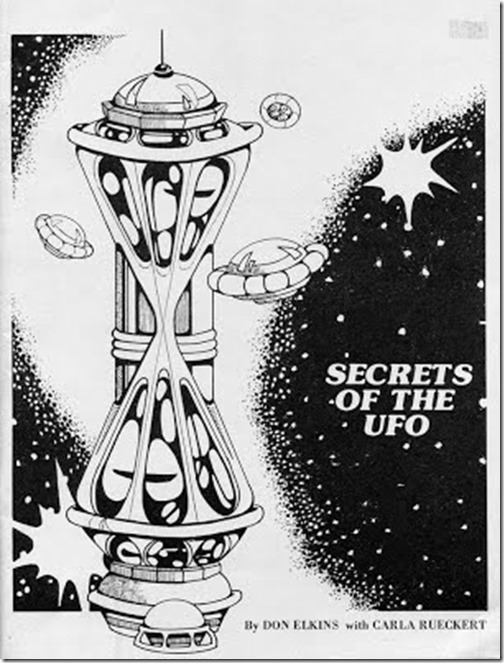 · Flying Saucer Review, FSR Publications Ltd., West Malling, Maidstone, Kent, England.